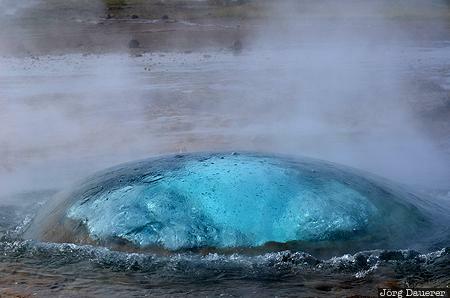 The typical blue-turquois bubble of the Strokkur Geysir that forms just before it erupts. Strokkur Geysir is in Suðurland in the south west of Iceland. This photo was taken in the morning of a sunny day in September of 2013. This photo was taken with a digital camera.